Michael Menchaca was born and raised in San Antonio, Texas. Being a child of two Mexican immigrants, he grew up valuing both American and Mexican cultures. As a child, becoming a cartoonist was his dream job. He began his professional education at San Antonio College — working in digital illustration and graphic design. He also learned traditional drawing skills, which is what he valued the most during his experience in community college. Menchaca then enrolled at Texas State University, where he studied Communication Design; shortly after starting the program, he decided to shift his focus to printmaking. 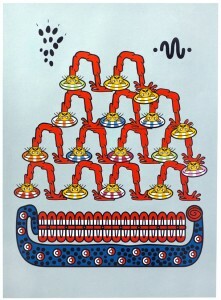 With serigraphy, he found a medium that allowed for flexibility while communicating graphically. He also became interested in current events. “The idea of writing a narrative based on news reports, specifically those involving U.S. immigration, was attractive,” said Menchaca. By using the form of an ancient codex, he was able to treat these current events as artifact and construct contextual metaphor. In the summer of 2011, Menchaca was admitted as a participant at the Skowhegan School of Painting and Sculpture residency. As a recipient of The Artist Foundation of San Antonio Award, he is currently working on continuing his “Codex Migratus” project. On December 18, 2012, Menchaca’s first solo exhibition opened at Gatehouse Gallery Laguna Gloria. AMOA-Arthouse’s New Works series presents cutting-edge art by emerging Texas artists taking their work in new directions. In this exhibit, Menchaca interprets current events along the U.S.-Mexico border through the exploits of a cast of cartoon animals. 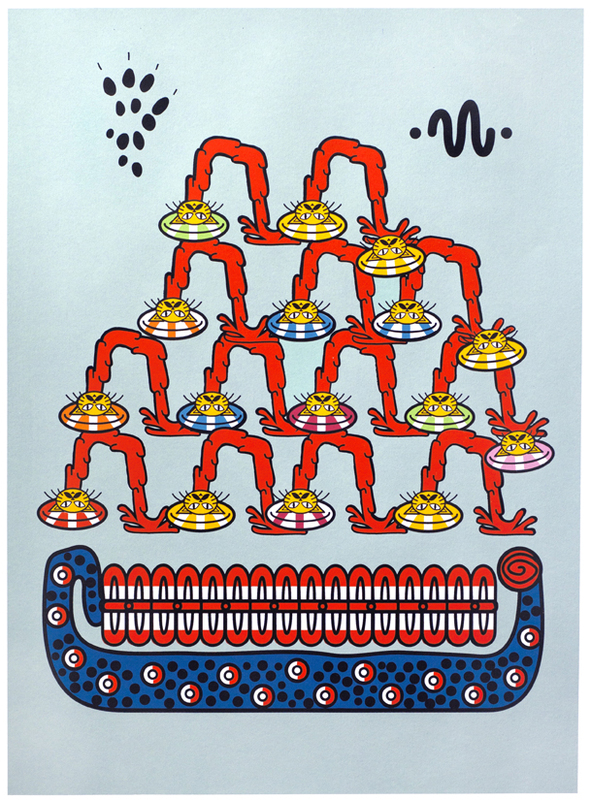 His boldly colored and graphic patterned designs draw inspiration from pre-Columbian codices, Pop Art prints, Chuck Jones’ animation, and Keith Haring’s painted murals. The exhibit continues through February 17, 2013.